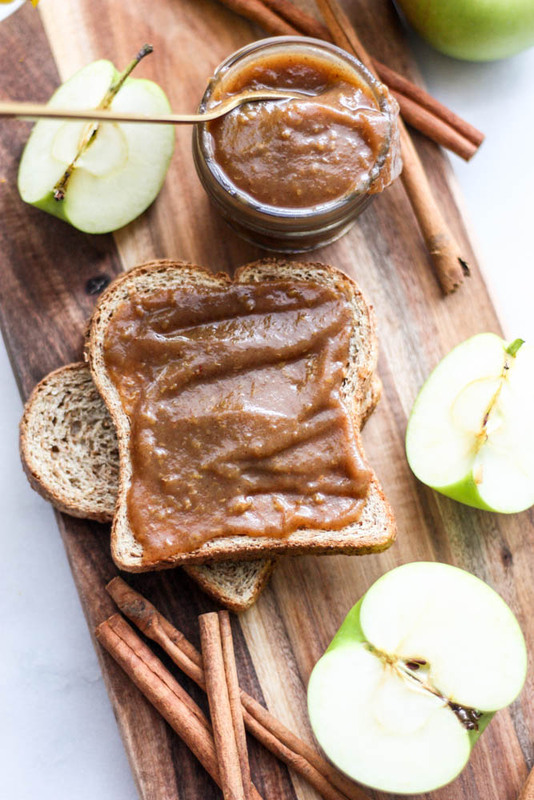 This perfectly sweetened and spiced Paleo Apple Butter is like a hug on toast. And you need it in your life. I’m going to tell you something that may make you think I’m the strangest person ever (I realize you may think this already). Until the age of about 12 or 13, I played with dolls almost every day. American Girl Dolls, to be exact. I was one of those kids that grew up late. J might argue that I never really grew up and that I’m just a large child, these days. But anyway, most of my time as a child and pre-teen was either spent outside playing in the woods, on the back of a horse, or with my dolls…playing in an imaginary world. Embarrassing, yes. Was I kind of a nerd? Totally. Am I grateful for it – absolutely. My favorite doll was named Felicity; a red-headed, horse loving girl making her way through colonial times in America. 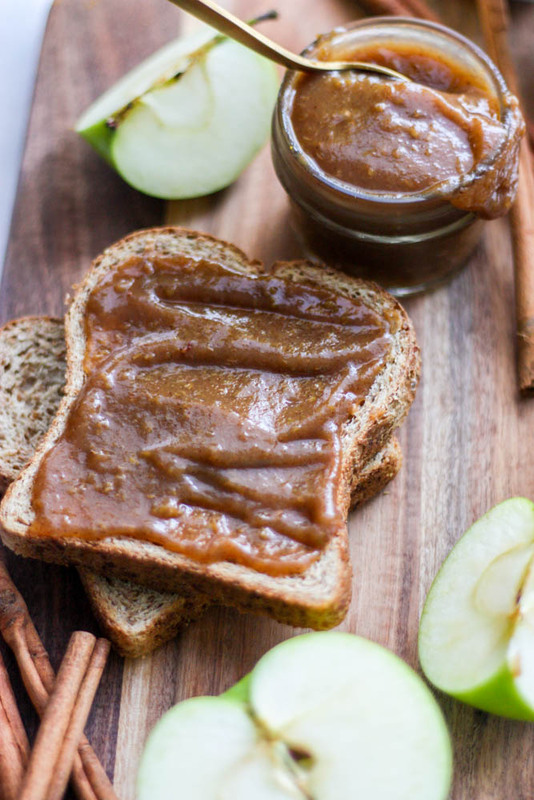 One of the absolute shining moments of my life was when my mom let me make her apple butter recipe for our Thanksgiving table one year. 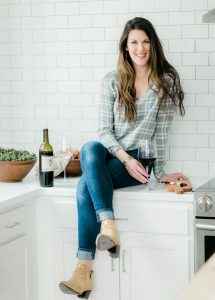 Which was a huge deal because I’m sure cooking with me on a holiday was nothing short of watching a tornado happen right in the kitchen. Thanks, mom. pause. can we take a minute to admire these sunflowers I picked? OK, moving on. I remember being SO PROUD as I watched everyone slather their apple butter on their rolls as they soaked up gravy and mashed potatoes on their plates. 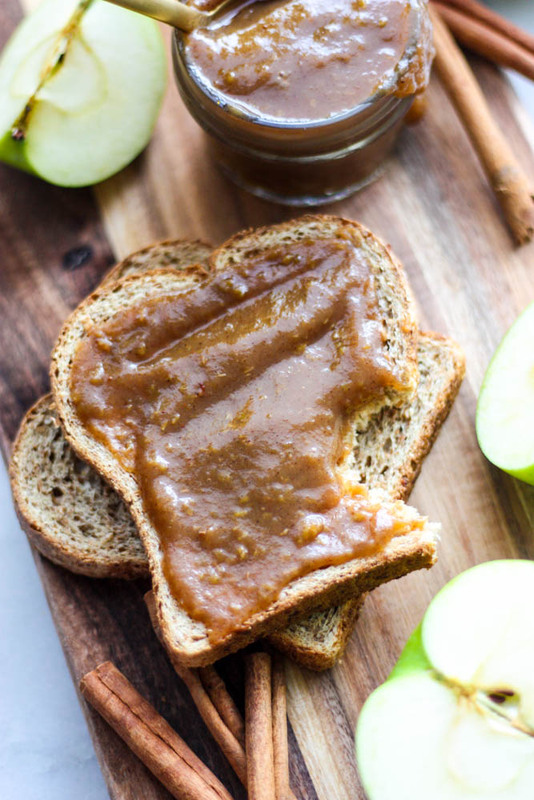 Ever since, I’ve been a fan of that apple butter stuff. 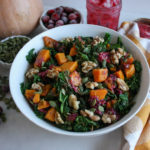 So, I decided to put a healthier, plant based & Paleo spin on an old time favorite and I hope you scarf it down as quickly as we did. 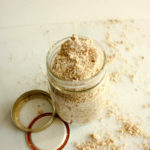 This recipe can be doubled, tripled, quadrupled, whatever and would make a wonderful homemade gift. Wash and quarter the apples and remove the core with a knife. Leave the skin on and drop them into a large stock pot. Add the apple cider vinegar, water, and maple syrup and bring the mixture to a slow boil over medium heat. Once the boil is reached, cover and allow the mixture to simmer for 10 minutes, or until all of the apples are soft and start to break apart. Remove the pot from the heat. If you have an immersion blender, feel free to use that to puree the mix, but I dumped everything into my food processor and pulsed until the mixture was just smooth. Pour the apple puree back into the stock pot over medium heat. Add the coconut sugar, cinnamon, allspice, and nutmeg. When a slow boil is reached, turn the heat to medium low and allow the apple butter to simmer, uncovered, to reduce for about 15 minutes, or until thick. 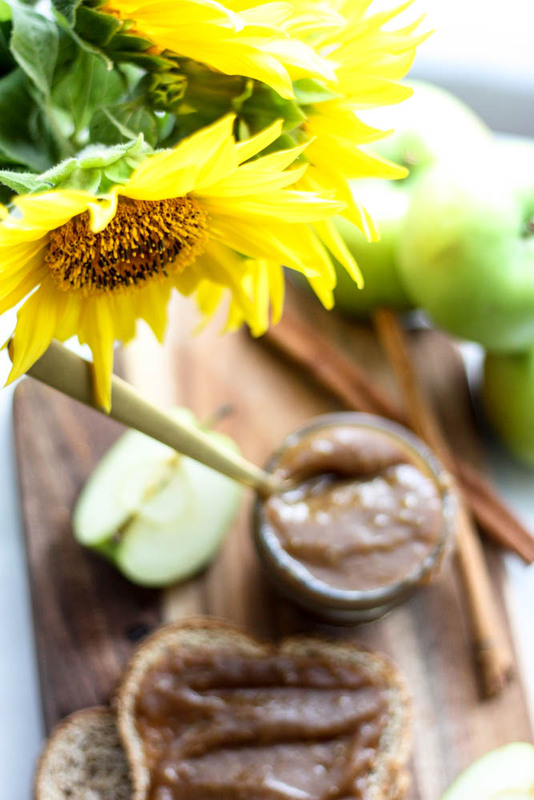 Remove from the heat and ladle apple butter into glass jars. This will keep well in the fridge for a few weeks. 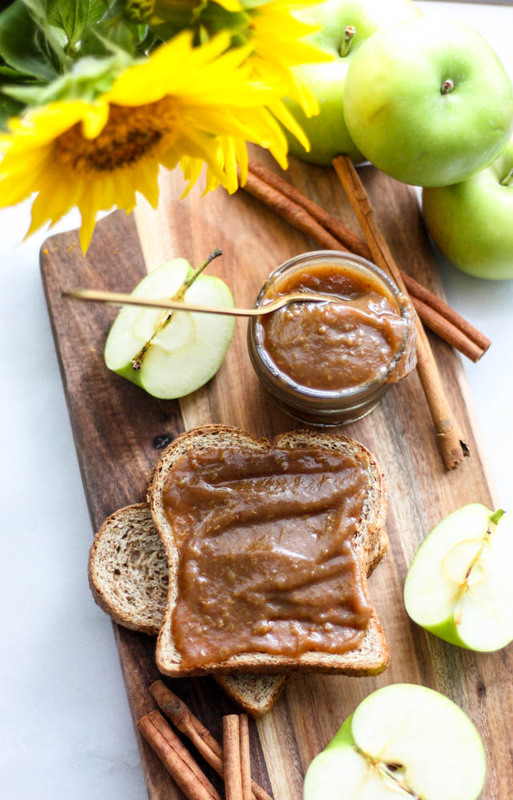 If you want to preserve and can the apple butter (it can sit in the pantry for about a year this way), follow the directions at the bottom of THIS post. Enjoy it on toast, yogurt, rolls, as a dip, on crackers, in a wrap, the options are endless! Wash and quarter the apples and remove the core with a knife. Leave the skin on and drop them into a large stock pot. Add the apple cider vinegar, water, and maple syrup and bring the mixture to a slow boil over medium heat. Once the boil is reached, cover and allow the mixture to simmer for 10 minutes, or until all of the apples are soft and start to break apart. Remove the pot from the heat. If you have an immersion blender, feel free to use that to puree the mix, but I dumped everything into my food processor and pulse until the mixture was just smooth. 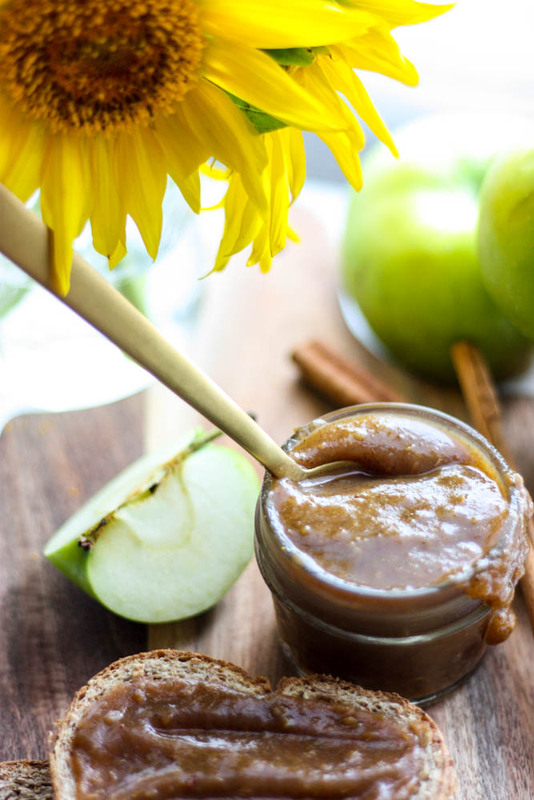 Remove from the heat and ladle apple butter into glass jars. This will keep well in the fridge for a few weeks. I am seriously drooooooling over this. And also totally jealous! I never had an American Girl Doll and always wanted one! such a sweet story! 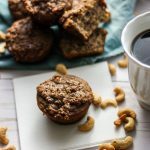 i have so many fond memories cooking with my mum, especially at holiday times! 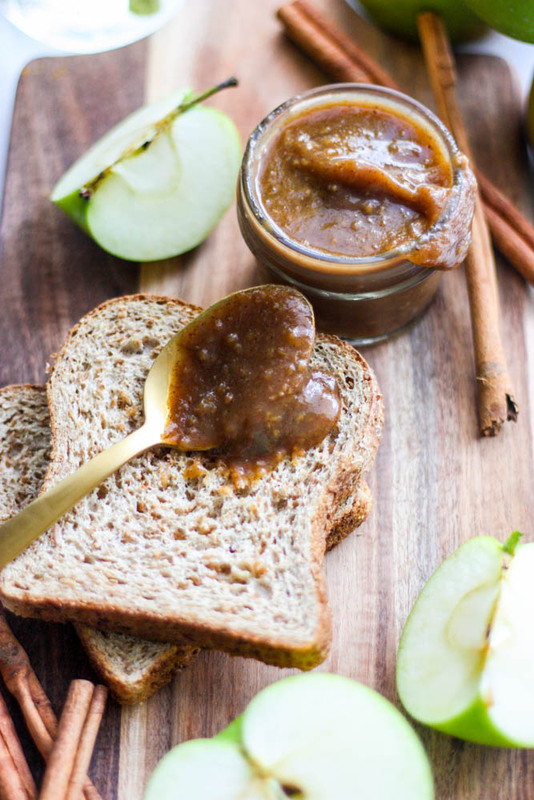 this apple butter looks fab, i’ve never eaten apple butter before! have a lovely weekend Allie! I am so glad! Let me know what you think!